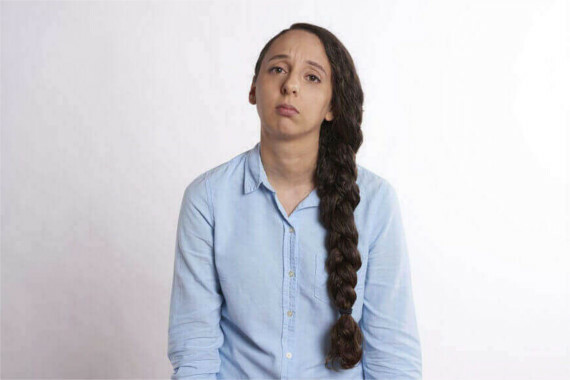 Having your learner logbook rejected and forfeiting your driving test booking can be easily avoided. Arriving at Vicroads on the day may be one of the more stressful moments in life. Our expert Werribee driving instructor explains how you can make sure your learners log book is completed correctly. You rely on our professional advice to help with your driving test preparation. We aim to make your test day as stress free as possible. But the majority of customers who contact us for training often overlook the one thing that will end their test before they even jump in the car. Show up to Vicroads with an incomplete or incorrect logbook and you’ll be shattered to find your test will be cancelled. You may have to wait at least 6 weeks before you can retake your test and lose all booking and test fees. At times, some testers may be a little bit more flexible than others if you can reasonably justify any logbook issues. However Vicroads policies with logbooks are very specific. Expecting any leniency or hoping to get lucky with an unsatisfactory logbook is crazy when it is so easy to make sure it complies beforehand. This guide provides a list of the common logbook mistakes and shows you some simple ways to avoid falling victim to the disappointment of a cancelled test booking. 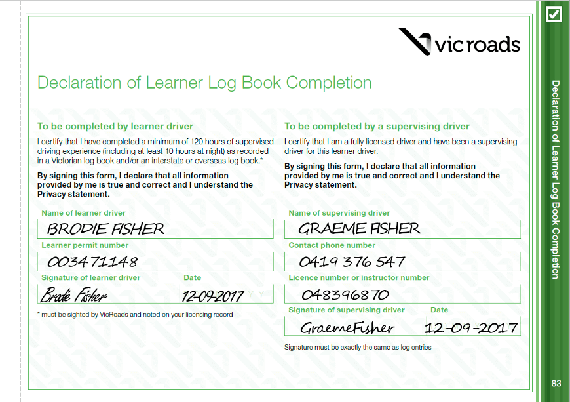 Who must complete a Vicroads Learner Log Book? Before you can attempt your driving test an official Vicroads Learner Log Book must be completed if you are less than 21 years old. This is to show you have had at least 120 hours of driving experience under the supervision of a fully licenced driver. Currently this includes at least 20 hours of night time driving. However if your learners permit was issued prior to 1st November 2017 you are only required to complete a minimum of 10 hours night driving. Filling in your logbook is fairly straight forward and it's best to get into good habits from your first driving lessons. Filling it in as soon as you jump in the car and right after you finish driving you’ll find it only takes a minute and will save you the headache of trying to correct your whole logbook a few days before your test. Take responsibility for filling in the logbook yourself so you can make sure it is completed correctly. When you go for your test, Vicroads will not care if it was “Mum’s fault” that details are missing. They simply won’t let you do your test and you will have to wait until they let you book another appointment. As a learner driver you must be supervised by a fully licenced driver. 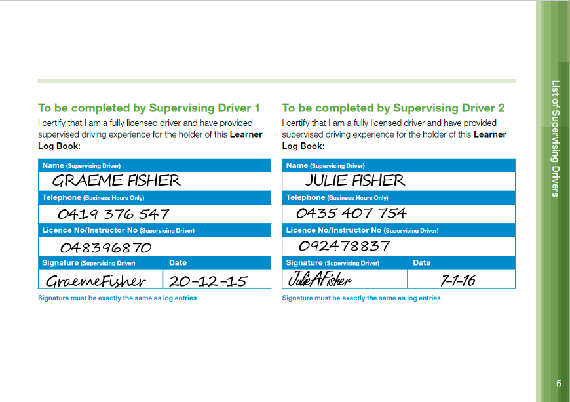 Get each supervisor to complete their details in the “List of Supervising Drivers” section near the front of the logbook. It’s best to do this the first time they drive with you in case they are hard to contact later. Each time you drive you simply fill in the details in each column on the "Log Entries" pages. It is important to fill in every section as any missing information can mean that entry will not be counted towards your total hours. Too many incorrect entries can reduce your total driving below the required 120 hours and you will not be permitted to take your drive test. Make sure your supervising driver completes their licence number correctly and that their signature is EXACTLY the same as the way they signed in the “List of Supervising Drivers” section. 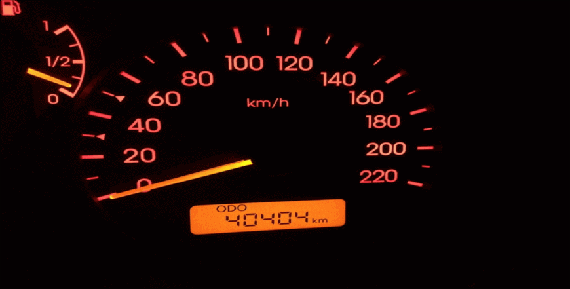 If you’ve forgotten to take your logbook with you on a drive, take a photo of the odometer before you start and when you finish. The photos will also record the start/finish date and times so that you can write them in your logbook later. Once you have completed your hours both you and one of your supervising drivers must fill in the “Declaration of Learner Log Book Completion” form. This page is just after the log entries pages. As with all other sections of your log book this must be completed fully by both you and one of your supervising drivers before you take it to Vicroads to be checked. Once you have completed at least 120 hours of supervised driving check through the following list and make sure you correct any of the following problems. Often the first thing the Vicroads officer will check is that the declaration form is completed by you and a supervising driver. Are all sections are filled in correctly? Check that licence numbers are correct and your supervisor’s signature matches the way they signed earlier in the book. 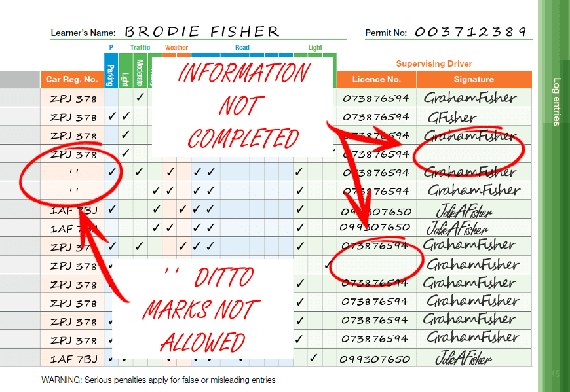 Every supervising driver that signs any of your driving log entries MUST complete their details in the “Supervising Drivers” section otherwise any driving you have done with that person will not be included in your total hours. 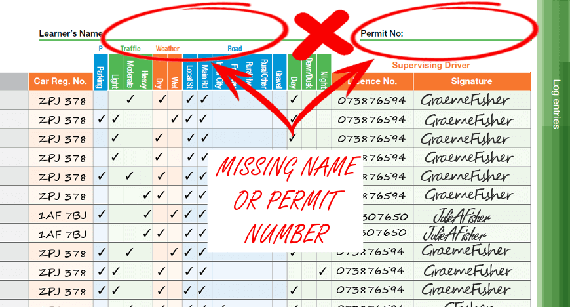 When we do a quick check of our customers log books during their driving test preparation we often see supervisor signatures that don’t match the one on the “Supervising Drivers” page. Slightly different handwriting is quite normal and as long as it isn’t too different it will usually be accepted. A bigger problem occurs when the supervising driver uses different versions of their signature. Many people have a long and short version of their signature and sometimes also sign with just their initials. 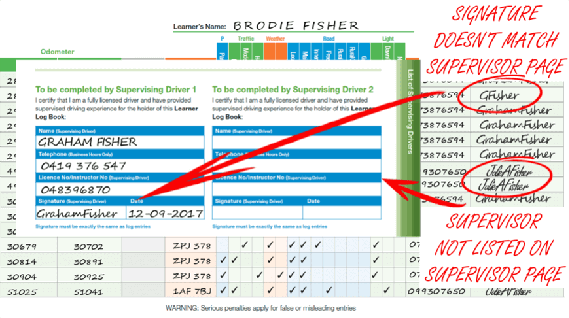 The signature used on the “Supervising Drivers” page MUST be the same for all their entries in your log book or the ones that don’t match will be deducted from your total hours. Every page in the "Log Entries" section must have your full name and learners permit number completed where indicated. Fill this in whenever you start a new page in case you forget later. It is too late once you are at Vicroads. Their log book policy states they will not accept logbooks if “any entries are made at a VicRoads Customer Service Centre on the day of a licence test”. 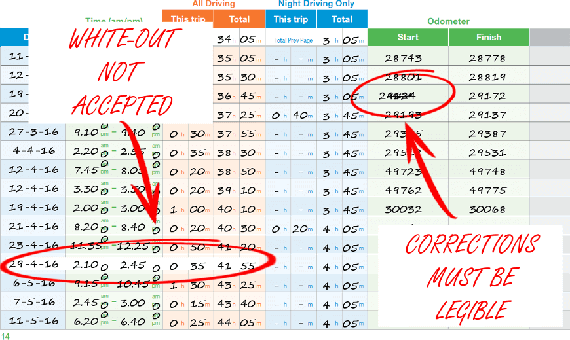 Log entries are your record of every drive you have done to get to 120 hours so you need to make sure every one of them is fully completed in black or blue pen and easy to read. Pencil is not allowed. If any section is missing details such as dates, signatures or licence numbers or if Vicroads are not satisfied entries are valid they will be taken off your total hours. It is OK if you have made a few mistakes along the way as long as they have been fixed up properly. The best way is to draw a line through the whole entry and re-write it on the next line. Do not use “white-out” as this will not be accepted. If it is only a small correction on part of an entry, make sure it is legible or it will not be included. Vicroads can refuse to accept your log book if there are any damaged or missing pages. To avoid any problems, don’t be careless with your log book. If you have a page with lots of mistakes, do not rip it out. It is best to cross out the whole page and re-write it on the next page. 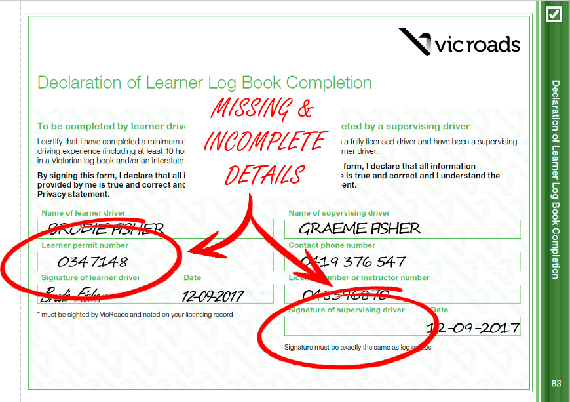 If you have several pages with mistakes, buy a replacement log book from Vicroads and re-write all your entries. As part of our test preparation services we provide a quick check of log books to our customers learning to drive in Werribee, Point Cook and surrounding areas. 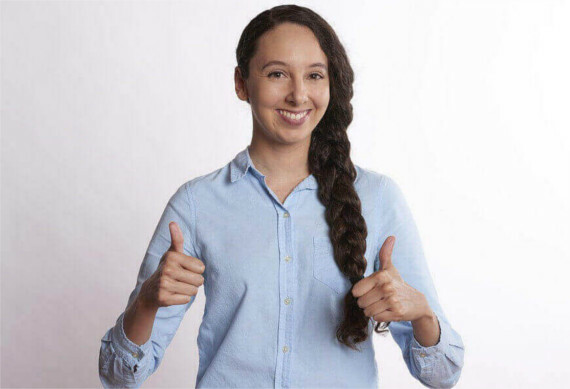 While most of the common issues are easily fixed with the suggestions on this page, it is ultimately up to the Vicroads testing officer to be satisfied your log book meets their requirements. While you are building up your driving experience aim for at least 130 hours. The extra hours can provide some security against a few entries that aren’t accepted even if you’ve been reasonably careful filling in your log book. Every time you fill a whole page of log entries, take a photo of each page. If your log book is lost or badly damaged you can copy the details from your photos into a replacement log book. Be sure to get all your supervising drivers to sign all the entries in the replacement log book and complete the “Supervising Drivers” section of the new book. By far the best way to make sure your log book doesn’t let you down on test day is to get it checked by Vicroads a few weeks before the date of your driving test. This allows you enough time to accumulate additional hours, make any corrections or complete a replacement log book if there are any issues you have missed. We find the most convenient time to get your book checked is when you visit Vicroads to do your Hazard Perception Test. Once it has been signed by a Vicroads officer you no longer have to record any further driving you do. Even though the completed log book details will be recorded by Vicroads we still recommend you bring it to your driving test in case there have been delays updating your records. Most log book errors can be easily avoided if you take a little bit of extra care and fill in each entry at the end of every drive. If you've almost completed your 120 logbook hours check out some of our other articles to prepare for the computer hazard perception test and find out what happens in the driving test. And remember we are always here to give you the best preparation for your driving test. Contact us today for the best driving test preparation. Eclipse Driver Training Melbourne is your best choice for driving lessons in Point Cook, Werribee and surrounding western suburbs.